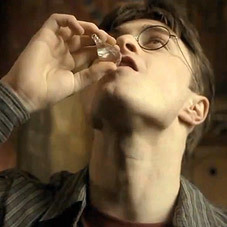 Los Angeles, CA—Actor Daniel Radcliffe, of Harry Potter fame, admitted to the press today his fate to one day face Lord Voldemort was “just too much” and may have contributed to his heavy drinking on the set. The Potter actor feels his naked escapades with those horses in that Broadway play “didn’t help.” In retrospect, Radcliffe is just happy he managed to turn down that “Katharine the Great meets Trigger” screenplay. Friend Luna Lovegood has a different angle and “suspects Nargles” as the main reason Potter was always potted. Championing a different theory, Dr. Hogbein, of the Hogbein Institute of Wizardry, believes J.K. Rowling’s “butterbeer” is a gateway fictional drink.